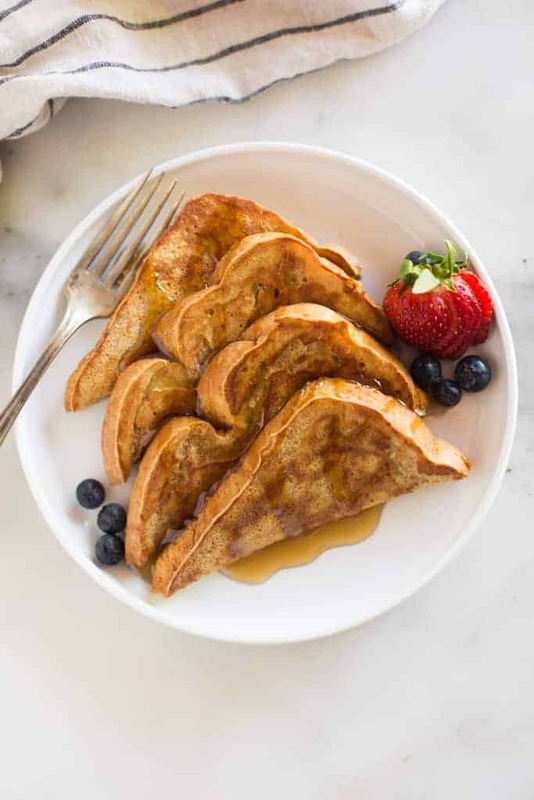 This Classic French Toast recipe is easy, uses simple pantry ingredients, and has a secret ingredient that makes a thicker batter with cinnamon sugar flavors that really set it apart. One of our family’s favorite breakfasts! 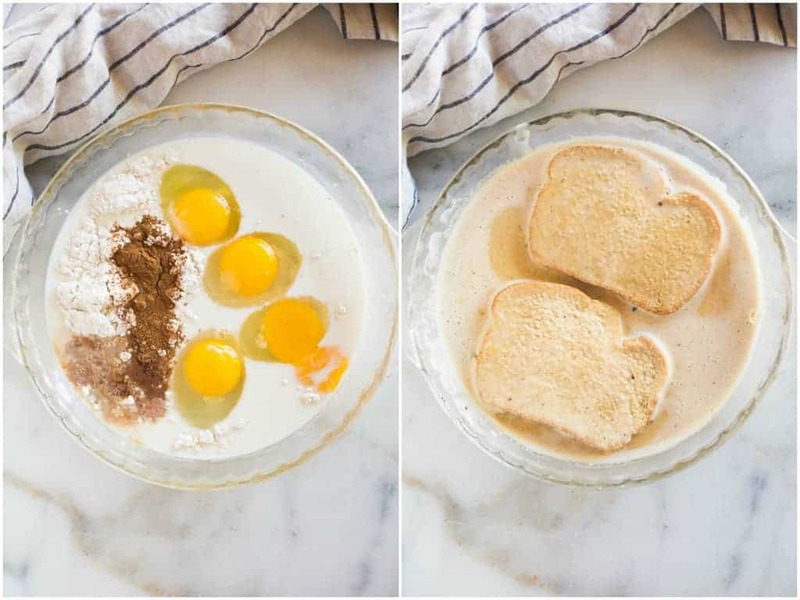 Saturday mornings are for breakfast: yummy, fancy, but easy breakfast! Now that I have little ones, “sleeping in” no longer happens. Scratch that; sleeping in no longer exists in my world! So in order to drag myself out of bed on the weekend I’ve got to envision something delicious to make for breakfast. I have lots of favorites, including sausage gravy and biscuits, and breakfast quesadillas. What are the ingredients for French Toast? 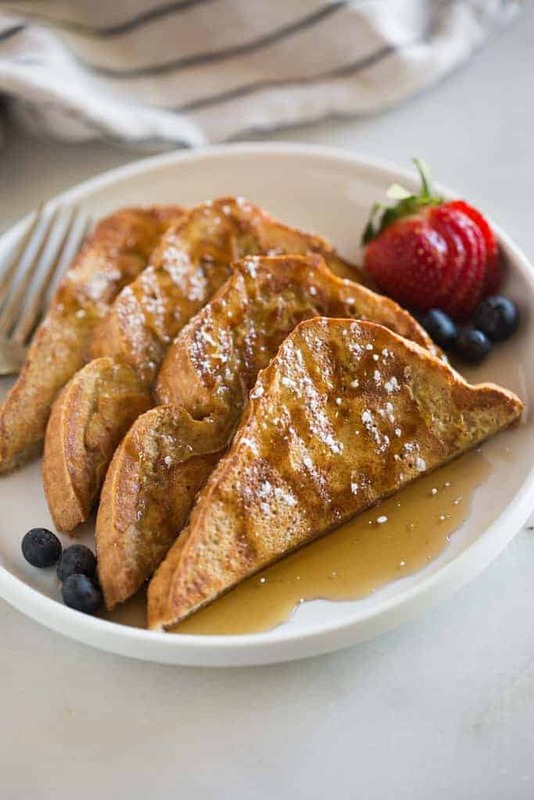 To make french toast, the ingredients you need are eggs, milk, sugar, salt, cinnamon, vanilla, and thick slices of bread. This recipe also calls for flour – the secret ingredient that makes this french toast better than all the rest! Add of the ingredients, except the bread, to a blender or shallow dish and whisk well to combine. I love to use thick bread, like Texas toast or this Sara Lee Artesano bread when I make french toast. It’s also nice if the bread is a few days old, or slightly stale, (although that’s not a requirement). For perfect French Toast, add flour to the batter. I know, I know, most people do a double take when they see flour in this recipe. The flour helps to make the liquid more of a “batter” which will yield extra fluffy and delicious french toast. Flour is the secret ingredients! You can whisk the batter by hand–you wont be able to get it completely smooth, but the small lumps of flour really wont matter when you cook it. You could also add all of the ingredients to a blender if you want, but don’t over-mix it. I’ve found that an 11×7” baking pan or a deep dish pie pan work great to whisk the batter in and to soak two pieces of bread at once. Any shallow dish with sides will work. I also use a griddle for cooking french toast. Heck, I use that thing for everything from pancakes and bacon to cooking tortillas. I love my French toast topped with fresh fruit, powdered sugar and this amazing (and EASY) homemade pancake syrup! You could add a dollop of whipped cream, a sprinkle of coconut, or a drizzle of nutella. You could sandwich the french toast together with something delicious in the middle, like this peanut butter banana stuffed french toast. Or, try rolling the bread around a sausage link to make these French toast sausage roll-ups. 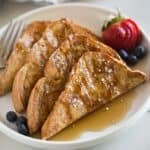 Easy Classic French Toast recipe that uses simple pantry ingredients, and has a secret ingredient that makes a thicker batter with cinnamon sugar flavors that really set it apart. One of our family's favorite breakfasts! Add all ingredients, except the bread, to a blender or to a shallow dish and whisk well to combine. If whisking by hand, it's okay if the flour doesn't mix in completely smooth. Remove to a plate. Serve warm, with syrup and a sprinkle of powdered sugar. 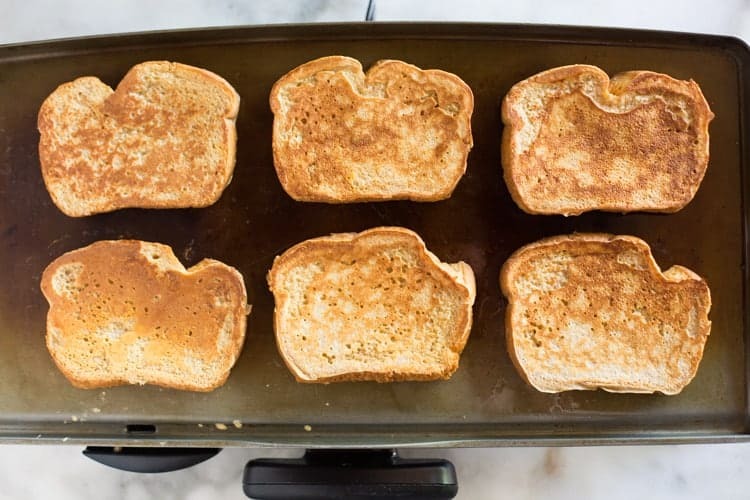 *Find my tips for perfect French toast, above in the post. Next time try overnight french toast! I originally shared this recipe in February 2015. Updated April 2018. This post contains affiliate links. I love to share the products I use with you guys! My son,(29) and my nephew, (27) loved this so much, I hardly got a taste. Will make more next time. I recently discovered a Delicious substitute for milk while making French toast for my grand-son. I used International Delights “Caramel Macchiato” coffee creamer. Was Superb. My 3yr. old granson ate 3 slices all up. Try using other flavors also. Made homemade egg bread specifically for french toast and then used this recipe. It was the best french toast I’ve ever had! That sounds incredible! Thanks for sharing! I was in the mood for French toast and googled for a recipe. When I read that you prefer Sara Lee Artesano bread, I knew that was the recipe fir me because I had just purchased that very bread. It came out FANTASTIC (and I am not much of a cook)! Ps. I had a bit of batter and fried that up too! French pancakes?! ?